DDT: Thirteenth Week inside the U.S.
Dictator Donald Trump (DDT) crowned the week of the March for Science by firing his U.S. Surgeon General Vivek H. Murthy. Possibly, Murthy’s belief that the over 33,000 deaths and more tens of thousands of woundings from gun violence is a public health issue doesn’t align with DDT’s philosophy. Murthy also believes in vaccinations for children. He had another two years in his four-year term. Rally instead of the White House Correspondent’s Dinner: The traditional annual dinner in 2011 to benefit the press association may have been the start for DDT’s push to become president, but he will be the first president to skip the event since Ronald Reagan after he was recovering from a failed assassination attempt. Instead DDT announced he will hold a “BIG” rally in Harrisburg (PA) at the culmination of the Mid-Atlantic Alpaca Association Jubilee. Hours before the traditional dinner is Samantha Bee’s “Not the White House Correspondents’ Dinner.” DDT’s 100th day in office will be a busy day for political wonks. Another Conservative Loss in Texas: For the third time this month, a court has ruled against the state’s voting laws, this time stating that the GOP-drawn voter map violates the U.S. Constitution with intentional discrimination against minorities. It’s a trifecta: the voter ID law, congressional maps, and state legislative maps all violate the federal Voting Rights Act. Now Texas faces the possibility of mandated federal approval before changing voting laws—not that big a deal since racist Jeff Sessions heads the “Department of Justice.” The minority vote on the panel of three argued that the maps were drawn to favor the Republican party rather than to discriminate against ethnic minorities. Deported Dreamers: Last year, DDT complained that a judge’s “Mexican heritage” prejudices him against DDT. Born in the U.S., Judge Gonzalo Curiel will now hear another case related to DDT, this one to determine whether DACA participant Juan Manual Montes Bojorquez was illegally deported. Homeland Security Secretary John Kelly has claimed that no person with an active DACA status has been deported, but Borjorquez is one of several people who disprove Kelly’s assertion. Proposed Nuclear Storage in Nevada: For the past 30 years, Nevada has fought an underground facility at Yucca Mountain to store nuclear waste. The issue was supposedly over in 2016, but DDT has allotted $120 million to resume licensing operations. Nevada opposed the plan on a variety of concerns, including volcanic hazard estimates, corrosion and toxic contamination risks. An experiment to determine Yucca’s suitability showed underground water and waste seepage issues, and research indicates that the place is “geologically and hydrologically active and complex.” Using Yucca Mountain would cost approximately $100 billion. DDT might want to consider what a nuclear accident at Yucca Mountain would do to his Las Vegas hotel. Another DDT-supporter, Matthew Heimbach, has claimed that he “acted pursuant to the directives and requests of Donald J. Trump and Donald J. Trump for President” and that “any liability must be shifted to one or both of them.” In his filing, Heimbach wrote that he “relied on Trump’s reputation and expertise in doing the things alleged.” DDT’s lawyers are also trying to stop a defamation civil suit filed by one of the women who accused DDT of sexual misconduct through the same claim that no one can sue the president. No First Amendment Rights for Protesters: In response to the lawsuits about violence at DDT rallies, lawyers argued that protesters “have no right” to “express dissenting views” at his campaign rallies because such protests infringed on his First Amendment rights. According to DDT’s lawyers, he was protected by First Amendment rights, but dissenting people don’t receive the same constitutional protection at his rallies. New Chief of Staff in White House: Before DDT was inaugurated, he said his children would have no role in his administration. Then Ivanka Trump joined as a senior adviser. It was legal because she wasn’t being paid. Now Ivanka, the “special” assistant, has a taxpayer-funded chief of staff. As well as a taxpayer-funded close adviser. And who knows how many more staff members for a member of DDT’s family. While taxpayers suffer, Ivanka Trump adds to her fortune because of her father’s “connections.” On the same night that she and her husband sat next to Chinese president Xi Jinping, China gave her three new trademarks with monopoly rights for her brand of jewelry, bags, and spa services, in addition to the existing 13 trademarks and 32 pending applications. She has over 180 pending and registered trademarks throughout the world. Her imports into the U.S., mostly from China, increased 166 percent last year and another 40 percent in the first quarter of 2017. Both Ivanka and her husband have extensive communication with China’s government. Kushner’s financial disclosure form lists 24 corporate entities directly related to his wife’s company, but Ivanka has not filed a disclosure. Dropping Polls: The pundits may have loved the DDT’s bombing in the Middle East, but his actions haven’t brought the hoped-for bump in popularity. Except for glowing comments from far-right media, polls show that he’s still at the lowest approval rating for new presidents, somewhere around 40 percent. Even worse is the loss of 17 points in the number of people who think that DDT keeps his promises—from 62 percent in February to 45 percent in April after people had a chance to watch him as president. He also lost seven points in being seen as a “strong and decisive leader” and a president who “can bring about changes the country needs.” The percentage of people who said they see him as “honest and trustworthy” also dropped by six points. Fewer than half of voters (46 percent) say they are “very or somewhat confident” in Trump’s ability to work with Congress, down from a 60 percent majority in December. House Speaker Paul Ryan’s (R-WI) has also dropped to 29 percent approval with with 54 percent disapproving. And that’s before this next week with the zombie health care reappearing and the potential of a government shutdown if DDT’s staff carries through with their blackmail threats. 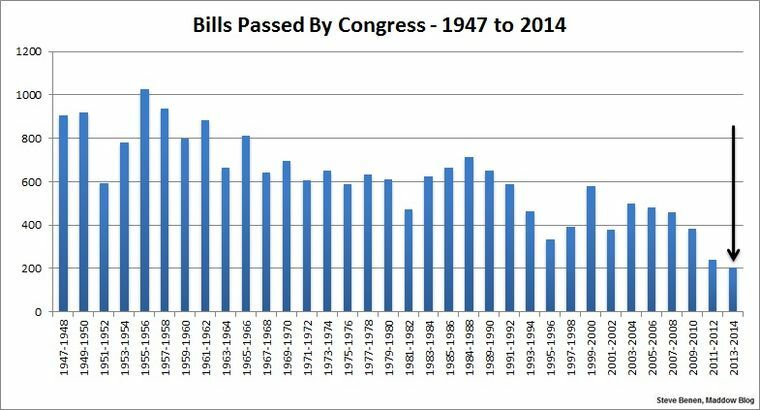 The 113th Congress passed 286 bills during its two-year term, only three more than the 112th Congress which had the lowest recorded total in congressional history and less than one-third of the 906 public bills passed by the infamous “Do Nothing Congress,” the 80th during Harry Truman’s second term as president. Fifty-one of these bill were signed last Thursday, saving the 113th from being the worst. Congress struggled to complete even routine tasks, and one-fifth of the bills were to name a postal or other government facility. The fall election netted Republicans 13 members in the House, leaving 188 Democrats. In the Senate, Democrats dropped to 44 members, losing eight seats. Two senators are progressive-leaning independents. Thirty-one states now have Republican governors, and 80 percent of those states also have a GOP legislature. Two years ago, Democrats won the Senate, had more votes for House members than Republicans did, and took the presidency through a majority vote. Despite these progressive victories, conservatives declared that they had a mandate to destroy President Obama and proceeded on that path. In this election, Republicans the same mandate, again trying to deny the president any rights. Announced his support for net neutrality, asking federal regulators to toughen their laws by putting utility-like regulation on broadband providers. Made a climate deal with China to reduce greenhouse gases. Issued an executive order to protect undocumented people from the threat of deportation and keep families together. Signed off on EPA regulations with the EPA to limit ozone emissions. Oversaw Western sanctions on the regime of Vladimir Putin, a move that is destroying the Russian economy and dropping the value of the ruble by at least one half. Explained to the people of the United States that the Keystone Pipeline benefits only huge corporations with resources in Canada. Renormalized relations with Cuba, effectively bringing a Marxist-Authoritarian government into the capitalist light and paving the way to ending a 54-year embargo against the country. Released 17 detainees from the prison at Guantanamo Bay, over 10 percent of the detainees at that time. Noted that the Treasury Department sold the last investment related to the Wall Street and auto bailouts. Another end-of-the-year surprise came after Sen. Ted Cruz (R-TX) insisted that his fellow senators stay in town to vote on a point of order. He wanted his fellow GOP senators to support his position that the spending bill was unconstitutional because it funded President Obama’s immigration actions. He got only 22 votes. Republicans were so angry that 20 of them, including leaders Mitch McConnell (R-KY) and John Cornyn (R-TX), voted against Cruz’s point of order. Cruz’s demand led to the confirmation of over 90 nominees, almost all those who were pending. 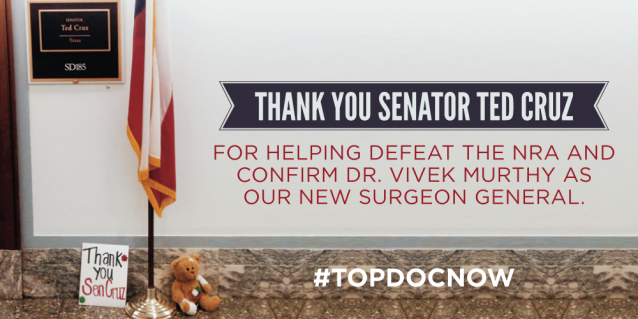 Notable among these is the confirmation of Surgeon General Vivek Murthy. Republicans had kept him waiting for 517 days on orders from the National Rifle Association because Murthy had called gun deaths a public health issue. Also Sarah Saldaña, confirmed as the firs Latina to head up the Immigration and Customs Enforcement, was opposed by almost all the Republicans. Her vote was 55-39, however, not as close as the 51 to 41 for Murthy. The lack of filibuster kept the vote for these people to a simple majority rather than the 60 percent necessary in the past. Another victory, thanks to Cruz, is the confirmation of 12 judicial nominees changing 9 of the 13 federal Circuit courts of appeal to a majority of Democratic appointments. Until recently, 10 of the 13 had a majority of appointments made by GOP presidents. The confirmations were also extremely diverse: 42 percent women, 19 percent African-American, 11 percent Hispanic, and 11 percent openly gay men or lesbian women, making this the most diverse group of judges in history. 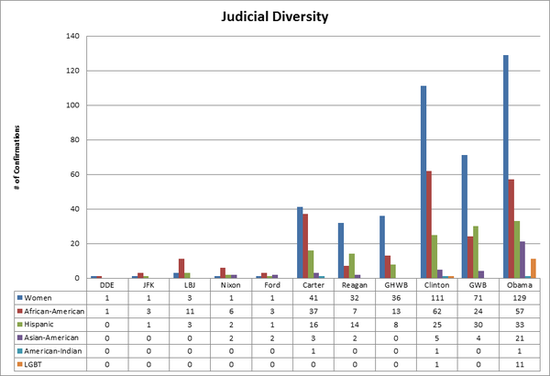 Diversity in judicial diversity appointments have greatly progressed since the middle of the 20th century. When President Obama started his first term, the conservatives—both politicians and pundits—predicted total disaster for the country. Despite their attempts to stop everything that the president promoted, the country is making progress. The conservatives were wrong. Gas is close to $2 a gallon, unemployment is falling, and the stock market, that skyrocketed during President Obama’s time, stays stable. The president’s approval rating is back up to 47 percent. The 5-percent annual pace of GDP growth in the third quarter of this year, revised up from the estimated 3.9 percent, is the best quarterly growth since 2003. That was the year before George W. Bush got his second term. Economists believe that the improving economy will continue. The news caused the DOW stock market to soar over 18,000—an increase of 224 percent since President Obama first took office. A majority of the public rates the country’s economy as “good” for the first time in seven years, when George W. Bush was president. In the CNN/ORC poll, 51 percent of the respondents found the economy to be either “somewhat good” or “very good,” up from 38 percent last October and 10 percent in September 2011. The economy added 321,000 jobs in November, surpassing expectations and giving 2014 the highest job growth since 1999. The unemployment rate is below 6 percent, the first time since George W. Bush left the country in shambles. Thus far this year, the U.S. added almost 2.7 million jobs, the most since 1999, and dropped the unemployment rate to 5.8 percent from when President Obama first took office. Unemployment rates fell in 41 U.S. states in November; only three states—Connecticut, Louisiana, and Washington—saw these rates go up. Mississippi has the highest rate at 7.3 percent. In six years, President Obama created 4.26 times as many jobs as his predecessor in eight years. Consumer spending surpassed previous estimates of 2.2 percent to 3.2 percent, partly fueled by the low price of gas. After saving hundreds of dollars this year, consumers may save an average of another $550 next year just on gas. About 6.4 million Americans have enrolled for individual insurance plans for 2015 through HealthCare.gov in the participating 36 states. Another one million people enrolled in individual states with their own exchange marketplaces. The drop in the number of uninsured is the largest in four decades. Despite promises from conservatives that private-sector employers will get rid of their own coverage plans, that hasn’t happened in many companies. Walmart dropping its plan was the exception, and that company’s plan was largely worthless to many employees because people were employed for fewer than 29 hours of work a week and therefore got no health insurance anyway. In other health expenditure news, premiums are going down and customer satisfaction is going up. The increase in health care spending is the lowest in 50 years, and the number of medical errors is shrinking system-wide. Rep. Darrell Issa’s (R-CA) attempt to destroy the president failed on two counts: Benghazi and the IRS. Much to the fury of many conservatives, a GOP-led House committee’s report, quietly released the day before Thanksgiving, stated that the Obama administration was not at fault for the four deaths at a diplomatic outpost in Libya. Two days before Christmas, Darrell Issa (R-CA), no longer chair of the House Oversight Committee as of January, released a report exonerating President Obama of any blame in the IRS scandal. Despite a waste of resources in an attempt to prove a connection between the president and accusations that the IRS had targeted conservative organizations for punitive action, Issa failed to support his false belief. Instead he resorted to attempts to connect Democrat legislators with the IRS scandal and rejected any information that the IRS targeted more progressive groups than conservative in investigating non-profit status. After two years of playing “gotcha” with the President of the United States, Issa lost. The Republicans had a lot to say about the president’s executive orders. Their response to good news? Nothing. Just silence. One last thing: Sean Hannity has been voted the worst news host by his colleagues at Fox, MSNBC, and CNN. As Michael Cohen wrote in The Guardian, “The only thing that stops a good guy against guns is the gun lobby.” Such is the case of nominee for U.S. surgeon general, Dr Vivek Murthy. Once the right-wing element in the country, led by Fox, had polished off the possibility of highly qualified civil rights attorney Debo Adegbile to attain a position in the Department of Justice, they attacked Murthy. His sin was declaring that gun violence is a public health issue because of the high rate of deaths and injuries every year from guns in the United States. One of the attacks was that he hadn’t done much in his career. Yet, former Surgeon General Dr. David Satcher emphasized Murthy’s “impressive track record of accomplishments as an innovative and well-respected thought leader in healthcare.” Satcher served for both Presidents Bill Clinton and George W. Bush. 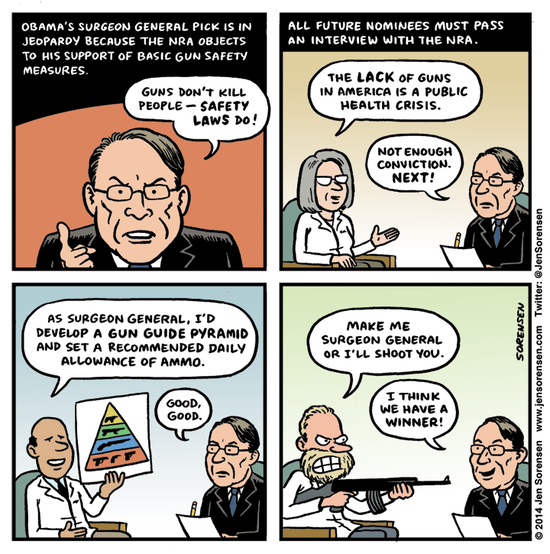 The NRA, a front for the gun industry, has long dabbled in public health issues. It tried to keep pediatricians from counseling parents about dangers of guns in the home just as medical professionals talk about the dangers of swimming pools and riding bicycles without helmets. A 2011 Florida gag law, crafted by the NRA for the gun industry, stopped doctors from “making written inquiry or asking questions concerning the ownership of a firearm or ammunition by the patient or by a family member of the patient.” A district court decision that the law violated free speech put the law into the appeals process. “Guns are a health care issue,” Murthy tweeted in 2012. He also stated, “Tired of politicians playing politics w/ guns, putting lives at risk b/c they’re scared of NRA.” The lobby group, backed by the gun industry, took great offense at this statement. But Murthy is right. Between eight and ten Democratic senators are afraid of voting for him, even if some of them are not running for re-election this year. That leaves the nomination without a simple majority in the Senate. The NRA, front for the gun industry, refuses to admit that the thousands of deaths and injuries from guns are, in reality, a public health issue. In 2010, the number of gun deaths was equal to those from car accidents, and the number of gun deaths is staying steady. In comparison, car accidents not kill people at ten percent the rate of 50 years ago when measuring the number of miles that people drive. The American Public Health Association calls gun violence in the United States “a major public health problem and a leading cause of premature death.” The American Medical Association adopted a resolution in 2011 officially opposing any law that prevents doctors from openly talking about gun safety and the risk of firearms in the household with patients. A 2013 essay in the New England Journal of Medicine recommends that a public health and safety campaign, like the one that greatly reduced deaths from car accidents, should be applied to gun deaths and injuries. The risk of homicide in neighborhoods located near a gun retailer is almost 13 times higher than in those far from one. The lapse of the Assault Weapons Ban in 2004 caused a surge in the homicide rate of more than 16.4 percent across the border in Mexico. Homicide rates in Mexican municipalities near California, where a state-level assault weapons ban was still in effect after 2004, rose less than in municipalities near other U.S. border states. The lapse of Missouri’s background check law to an annual rise of 60 murders. The result of the NRA lobbying on behalf of the gun industry is that more and more states are eradicating gun laws. The NRA has no concern about the increasing carnage from guns in the United States; it just serves as a shill for the gun industry. The rejuvenated gun industry has brought big bucks to the NRA. The 300 manufacturers representing $6 billion in revenue donated over $76 million to the NRA in just 2009. Small and medium-sized gun sellers also give liberally to the NRA. The 54,000 licensed dealers and the industry as a whole may employ as many as 100,000 people. Claiming President Obama as a threat, the NRA boosted expenditures from 2006 to 2010 by 37 percent. By 2012, the NRA’s revenues swelled to $256 million with three individuals giving $3 million or more and another 15 donors writing checks of between $100,000 and $1 million. As a non-profit, the NRA doesn’t have to name its donors. The National Shooting Sports Federation generously credits the gun industry with benefiting the U.S. economy by $18 billion. Yet the NRA and the gun industry cost the people of the United States $47 billion every year because of deaths and injuries. In Mexico, 50 percent of the 120,000 murders are from guns, and 68 percent of the guns in Mexico came from sales in the United States. In 2012, Washington state saw the highest tally of gun injuries since 1995 and 30 percent higher than the average during that period. At the same time, firearms conducted three times the number of background checks for gun sales as a decade earlier. A measure requiring firearm dealers to offer trigger locks when selling guns, as 11 states already require, went down in flames. So did a measure to make it a crime of reckless endangerment for adults to allow an unsupervised child to gain access to a gun that results in shooting. That crime exists in 28 states. In Georgia, a House bill would allow convicted felons who kills someone with an illegally possessed gun to claim justification under the state’s Stand Your Ground law. If the measure passes, Georgia convicted felons can’t vote, but they can legally kill someone. A second measure would allow concealed guns on college campuses, despite the opposition of 78 percent of polled Georgians. Florida has become notorious for the effects of its Stand Your Ground law, especially after a Tampa Bay Times’ review of 200 cases found an “uneven application” and “shocking outcomes.” State Rep. Matt Gaetz (R-Fort Walton Beach) has a solution for this problem: don’t let anyone find out about what happens with Stand Your Ground in Florida. He has filed an amendment to stop access to court records in self-defense cases. People found innocent in one of these cases could “apply for a certificate of eligibility to expunge the associated criminal history record.” This amendment is attached to the bill that gives Stand Your Ground immunity to anyone who fires warning shots during a confrontation. The Sunshine State has an answer for the public health problem of gun deaths and injuries: just shut off the lights. Watch the rest of the country follow suit.